The Yankee family lost another member when Clyde King passed away on November 3 at the age of 86. King, a baseball lifer who spent six decades in the game, was the quintessential Yankees employee during the tumultuous first half of George Steinbrenner’s reign. After joining the organization in 1975, King performed just about every function imaginable, including scout, special assistant, pitching coach and manager…all in one season during 1982! When King ascended to the Yankee throne in 1982, he was the third manager that season and the team’s ninth in the previous 10 seasons. Before taking the job, however, he had developed a reputation as “one of George’s spies” and engendered much mistrust throughout the organization, a sentiment that filtered to many scribes in the media. So, when the time finally came for him to “reluctantly” take over for Gene Michael (who had taken over from Bob Lemon earlier in the season), his hiring was met with much derision. The welcome Clyde King received from the baseball press corps made Joe Torre’s “Clueless Joe” introduction look quaint. In a particularly mean-spirited column with the headline “King May Be Fool in George’s Court”, the Pittsburgh Post-Gazette’s Phil Musick recalled a game in 1969 when as manager of the Giants King’s ignorance of a rule almost cost his team a run. Musick concluded by asking, “has Steinbrenner bought a manager in a poke”? More than any other reason, King was criticized harshly because most people believed him to be a clubhouse mole who sabotaged previous administrations with the hope of paving his way to the top. That perception couldn’t have been further from the truth. After about a month as Yankees’ manager in 1982, it soon became clear to everyone that Clyde King was nothing more than a good baseball man. Phil Pepe, one of his earlier critics, went so far as to pen an open apology in a column that included very high praise from a series of anonymous Yankees. Pepe concluded the column by writing, “I think he has earned a shot to manage the Yankees in 1983. I hope George Steinbrenner does too”. Unfortunately, the Boss did not agree. 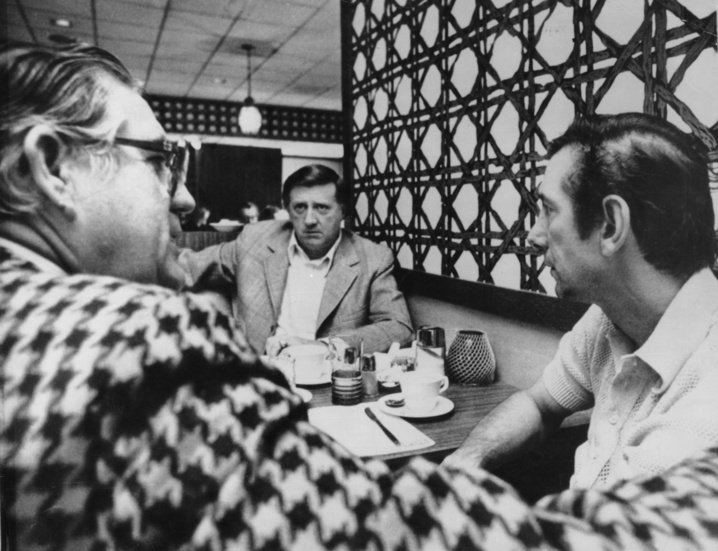 King, then a scout, confers with George Steinbrenner and Billy Martin over coffee in 1976. King became Yankees manager as a reluctant villain, but exited the job a much more sympathetic figure. All throughout the winter, Steinbrenner refused to make a decision on King’s future, forcing him to answer almost daily questions about the likelihood of his return. In a January 7, 1983 article filed by AP, King recalled an interview with Red Auerbach in which the legendary Celtics’ general manager and coach corrected a reporter, who stated he had the best job in sports, by declaring, “Whoa, the best job in professional sports is managing the New York Yankees”. You see, King really did want to manage the Yankees, but he was just too proud to beg for it. Days later, the Yankees hired Billy Martin for his third tour of duty. As was often the case with a fired Yankee manager, King moved from the stressful life of the dugout to a well paid advisory position and waited for his spot on the wheel to come up again. 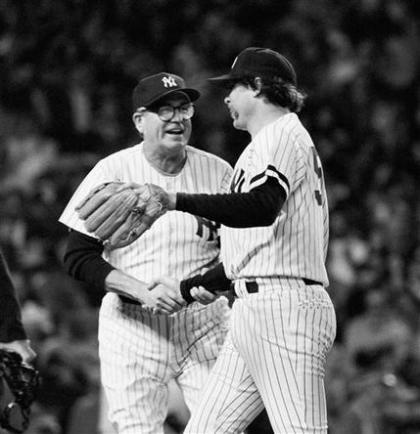 Only one season after relinquishing the manager’s chair, King was promoted in 1984 to vice president and general manager, a role he held for three seasons, a lifetime in Steinbrenner years. Despite failing to make the playoffs, the Yankees enjoyed considerable success from 1984 to 1986, winning 274 games, which was only one fewer than the Detroit Tigers for most in that span. Although King’s most notable acquisition as GM was the blockbuster deal that brought Rickey Henderson to the Bronx, his most impressive accomplishment was jettisoning contracts like Roy Smalley, Steve Kemp, Omar Moreno, Rick Cerone, Tim Foli and Toby Harrah. What’s more, King didn’t just dump those misguided signings from previous administrations, he got outstanding value in return. For Smalley, he netted Doug Drabek. For Kemp and Foli, he got Jay Buhner. For Cerone, he picked up Brian Fisher. Combined with other emerging young players from within the organization like Don Mattingly, Dan Pasqua and Mike Pagliarulo, King had assembled a very impressive core of young talent, all while remaining a pennant contender. King, and the Yankees, never got to see that bright future because his tenure as GM came to an end after the 1986 season, at which point all of his hard work was quickly dismantled. Just weeks after Woody Woodward took over the role, Drabek was traded for a trio of pitchers head by an aging Rick Rhoden. In 1987, Pasqua would be dealt for Rich Dotson. Then, in 1988, Buhner would be out the door in the infamous trade that brought back Ken Phelps. After been removed as general manager, King once again performed various roles within the organization, including most recently as a special assistant to the general manager from 1998 to 2005. Although his imprint was far indelible, King’s legacy as a company man during a hectic time in the franchise’s history is certainly not one to be forgotten. Long live the memory of Clyde King. Those are some notable ones, but for sentimental reasons, no trade will ever hurt as bad as the Juan Samuel deal. …It sent fan favorites dykstra and McDowell to the phillies.